Abstract: Plantar fibromatosis (Ledderhose disease) is a rare, benign, hyperproliferative fibrous tissue disorder resulting in the formation of nodules along the plantar fascia. This condition can be locally aggressive, and often results in pain, functional disability, and decreased quality of life. Diagnosis is primarily clinical, but MRI and ultrasound are useful confirmatory adjuncts. Given the benign nature of this condition, treatment has historically involved symptomatic management. A multitude of conservative treatment strategies supported by varying levels of evidence have been described mostly in small-scale trials. These therapies include steroid injections, verapamil, radiation therapy, extracorporeal shock wave therapy, tamoxifen, and collagenase. When conservative measures fail, surgical removal of fibromas and adjacent plantar fascia is often done, although recurrence is common. This review aims to provide a broad overview of the clinical features of this disease as well as the current treatment strategies being employed in the management of this condition. Plantar fibromatosis (PF), or Ledderhose disease as it is eponymously known, is a rare pathology of the plantar aponeurosis characterized by disordered fibrous tissue proliferation and the subsequent formation of nodules.1 Compared with Dupuytren’s disease, the upper extremity analog of PF, relatively little has been published since German physician Georg Ledderhose first described his initial observations of 50 cases in 1897.2 However, more recent literature has elucidated a framework for clinical diagnosis and optimal treatment of this condition. This review, based on available studies devoted to PF from the US National Library of Medicine and National Institutes of Health database (PubMed.gov), describes the relevant anatomy, diagnostic workup, and approach to treatment for the uncommon and challenging disorder. Figure 1 Anatomy of the plantar fascia. Physical examination is of paramount importance in the diagnosis of plantar fascia fibromatosis. The practitioner must perform a visual assessment of the foot, which can identify swelling, skin breakdown, bruising, or deformity. Bony prominences must be palpated along with tendinous insertions along the heel and midfoot. The presence of an Achilles tendon or gastrocnemius contracture must also be noted, as it can contribute to one’s symptoms. Ankle and hindfoot motion must also be documented, as well as the patient’s gait. The differential diagnosis must include calcaneal stress fracture, tarsal tunnel syndrome, and plantar fasciitis. Although the presence of a single (or multiple) well-defined nodules along the plantar fascia is pathognomonic for fibromatosis, other pathology may be present concurrently. The squeeze test can identify a calcaneal stress fracture, and is performed with the examiner performing medial and lateral heel compression along the posterior tuberosity of the calcaneus. Swelling and warmth may also be present. Tarsal tunnel is identified by the presence of pain and numbness that radiate to the plantar heel with percussion of the tibial nerve in the tarsal tunnel. 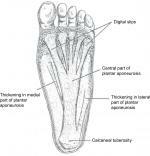 Plantar fasciitis presents with tenderness over the medial aspect of the calcaneal tuberosity. The natural history of the disease has been described as three distinct phases.1 Initially, there is a proliferative phase characterized by increased fibroblastic activity and cellular proliferation. An active phase follows, in which nodule formation occurs. Finally, there is a residual phase marked by collagen maturation, scar formation, and tissue contracture. Figure 2 Sagittal T2 MRI demonstrating a plantar fascia fibroma. 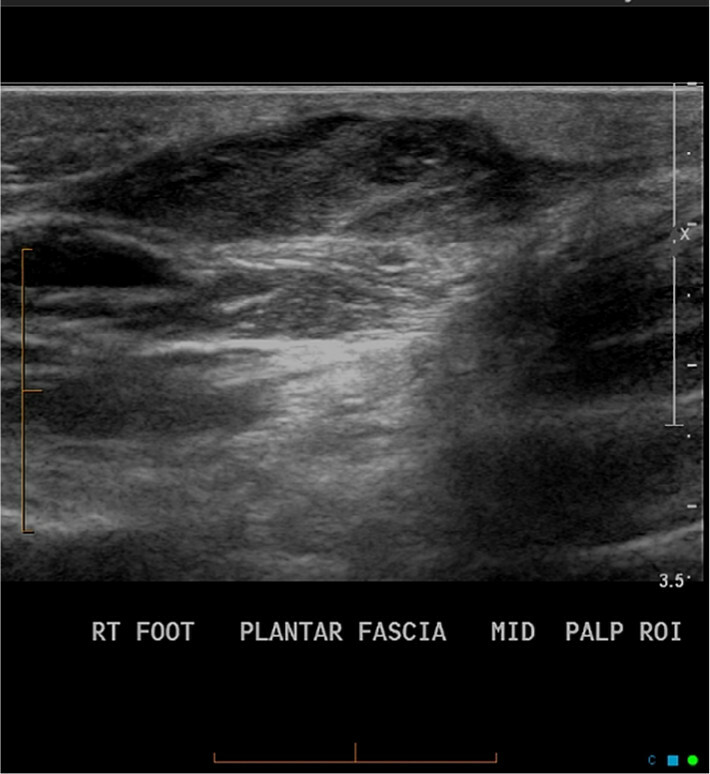 Figure 3 Plantar fibroma as seen on ultrasound. Several non-surgical options exist for the symptomatic management of PF, with varying degrees of scientific evidence to support their use. Many of these modalities have been used with differing degrees of success for other hyperproliferative fibrous tissue disorders. Given the low morbidity associated with many of these measures, it is prudent for the physician and the patient to use conservative measures prior to recommending surgery. Interestingly, the pathophysiology of hyperkeratotic scars and fibroma formation is quite similar as both are highly influenced by the expression of TGF-β and bFGF. Thus, certain treatments for hyperkeratotic scars have been employed on fibromas. One recent study demonstrated that using steroid injections along with verapamil on hypertrophic scars was more effective at reducing the size of the scar than either treatment alone.26 This synergistic effect demonstrates the overlap in management between different hyperproliferative, fibrous tissue disorders. Verapamil as an independent treatment modality will be subsequently discussed. Anecdotally, verapamil has been used as a first-line treatment in the conservative management of PF; however, there is little published data assessing its efficacy.9 One study has shown that 15% transdermal verapamil cream and intralesional verapamil can decrease plaque size in Peyronie’s by up to 55%–85%, with the only adverse effect observed being contact dermatitis.9 Treatment recommendations for Peyronie’s include using the transdermal cream twice a day for 9 months, or one intralesional injection every other week.9,27 Based on the similar pathophysiology of Peyronie’s and PF, it is reasonable to consider verapamil as an initial primary or adjunct treatment in conservative management of the latter. One recent study has demonstrated that after treatment with radiation, one-third of patients with PF had complete remission of their nodules and slightly more than half of the patients had partial remission. Nearly two-thirds of patients reported pain remission and gait improvement as well.9,28 Another study evaluating patient outcomes demonstrated that 94% of patients reported minimal toxicity and a high rate of satisfaction with radiation treatment.30 Radiation treatment in PF has been shown to be an effective modality for decreasing the size of the nodules and alleviating associated symptoms and can be a possible treatment option for those patients pursuing conservative treatment measures. The decreases in both contracture rates and proliferative activity of fibroblasts show that antiestrogen therapy has promise as a conservative treatment for PF. Another study involving Dupuytren’s patients showed that 15%–20% reported nodule size regression and 25%–30% reported no further increase in nodule growth after treatment with an antiestrogen.35 Thus, using antiestrogens like tamoxifen for patients with PF may help to prevent the progression of the disease. Collagenase is a matrix metalloprotease that breaks down peptide bonds in order to dissolve interstitial collagen. Collagenase Clostridium histolyticum (CCH) is a mixture of two collagenases (AUX-1 and AUX-2) that has been shown to decrease contractions in Peyronie’s and Dupuytren’s and is currently being studied as a treatment option for PF.9,36 A recent study tested the effectiveness of CCH by injecting it into a nodule once a month for 3 months; this failed to improve nodule size, softening, or pain with ambulation.36 It is likely that the anatomical nature of PF (nodules) compared with that of Peyronie’s and Dupuytren’s (plaques and cords) plays a role in the ineffectiveness of CCH for treatment of the former. The only documented adverse effects of this treatment are erythema, ecchymosis, and pain at the injection site.9 More studies are necessary to further evaluate CCH as an effective treatment modality. The optimal management of PF continues to evolve as a multitude of standard conservative therapies and emerging treatment options have been studied with varying degrees of efficacy. Given the benign nature of this condition, conservative therapies continue to be first-line options for symptomatic management; however, convincing, long-term research surrounding their use does not yet exist. Further research is needed to determine an optimal treatment algorithm. Several operative options exist for recalcitrant or particularly aggressive cases, although recurrence of the nodules is not uncommon. Lee TH, Wapner KL, Hecht PJ. Plantar fibromatosis. J Bone Joint Surg Am. 1993;75(7):1080–1084. Dürr HR, Krödel A, Trouillier H, Lienemann A, Refior HJ. Fibromatosis of the plantar fascia: diagnosis and indications for surgical treatment. Foot Ankle Int. 1999;20(1):13–17. Rosenbaum AJ, Dipreta JA, Misener D. Plantar heel pain. Med Clin North Am. 2014;98(2):339–352. Lareau CR, Sawyer GA, Wang JH, Digiovanni CW. Plantar and medial heel pain: diagnosis and management. J Am Acad Orthop Surg. 2014;22(6):372–380. Neufeld SK, Cerrato R. Plantar fasciitis: evaluation and treatment. J Am Acad Orthop Surg. 2008;16(6):338–346. Johnston FE, Collis S, Peckham NH, Rothstein AR. Plantar fibromatosis: literature review and a unique case report. J Foot Surg. 1992;31(4):400–406. Jeswani T, Morlese J, Mcnally EG. 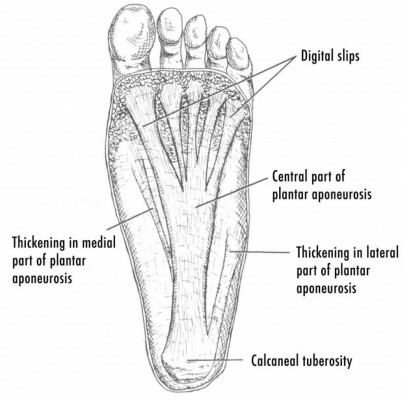 Getting to the heel of the problem: plantar fascia lesions. Clin Radiol. 2009;64(9):931–939. Gudmundsson KG, Jónsson T, Arngrímsson R. Association of Morbus Ledderhose with Dupuytren’s contracture. Foot Ankle Int. 2013;34(6):841–845. 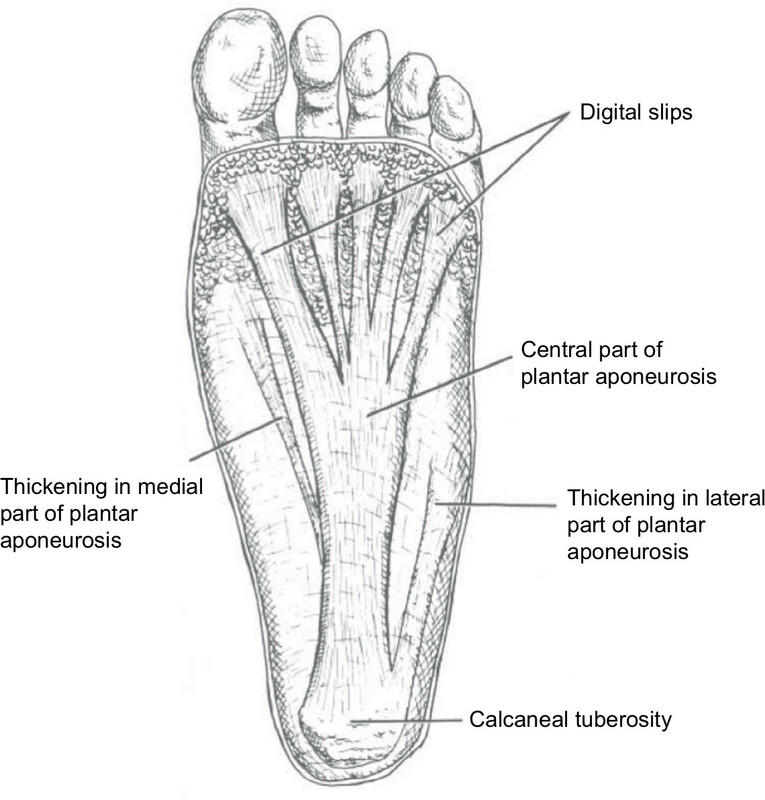 Carroll P, Henshaw RM, Garwood C, Raspovic K, Kumar D. Plantar fibromatosis: pathophysiology, surgical and nonsurgical therapies: an evidence-based review. Foot Ankle Spec. 2018;11(2):168–176. Ledderhose Disease. Gaithersburg. National institutes of health genetic and rare diseases information center; c2017-18 (updated 2018 April 1; cited 2018 April 23). Available from: https://rarediseases.info.nih.gov/diseases/6873/ledderhose-disease. Accessed April 23, 2018. Godette GA, O’Sullivan M, Menelaus MB. Plantar fibromatosis of the heel in children: a report of 14 cases. J Pediatr Orthop. 1997;17(1):16–17. Fausto de Souza D, Micaelo L, Cuzzi T, Ramos-E-Silva M. Ledderhose disease: an unusual presentation. J Clin Aesthet Dermatol. 2010;3(9):45–47. Pickren JW, Smith AG, Stevenson TW, Stout AP. Fibromatosis of the plantar fascia. Cancer. 1951;4(4):846–856. Strzelczyk A, Vogt H, Hamer HM, Krämer G. Continuous phenobarbital treatment leads to recurrent plantar fibromatosis. Epilepsia. 2008;49(11):1965–1968. Kim SK, Ioannidis JPA, Ahmed MA, et al. Two genetic variants associated with plantar fascial disorders. Int J Sports Med. 2018;39(4):314–321. Espert M, Anderson MR, Baumhauer JF. Current concepts review: plantar fibromatosis. Foot Ankle Int. 2018;39(6):751–757. English C, Coughlan R, Carey J, Bergin D. Plantar and palmar fibromatosis: characteristic imaging features and role of MRI in clinical management. Rheumatology. 2012;51(6):1134–1136. Yasui Y, Takao M, Miyamoto W, Matsushita T. Plantar fibromatosis with flexion contracture and valgus deformity of the great toe. J Orthop Sci. 2016;21(3):395–398. Veith NT, Tschernig T, Histing T, Madry H. Plantar fibromatosis--topical review. Foot Ankle Int. 2013;34(12):1742–1746. 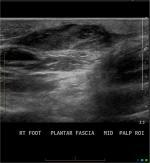 Mcnally EG, Shetty S. Plantar fascia: imaging diagnosis and guided treatment. Semin Musculoskelet Radiol. 2010;14(3):334–343. Woertler K. Soft tissue masses in the foot and ankle: characteristics on MR Imaging. Semin Musculoskelet Radiol. 2005;9(3):227–242. Draghi F, Gitto S, Bortolotto C, Draghi AG, Ori Belometti G. Imaging of plantar fascia disorders: findings on plain radiography, ultrasound and magnetic resonance imaging. Insights Imaging. 2017;8(1):69–78. 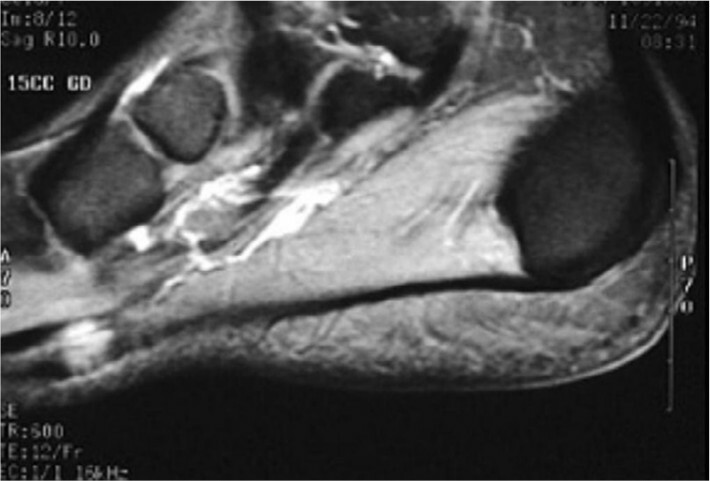 Cohen BE, Murthy NS, Mckenzie GA. Ultrasonography of plantar fibromatosis: updated case series, review of the literature, and a novel descriptive appearance termed the “Comb Sign”. J Ultrasound Med. 2018;37(11):2725–2731. Plantar Fibroma. Chicago. American college of foot and ankle surgeons; c2018 [cited 2018 April 23]. Available from: https://www.acfas.org/footankleinfo/Plantar_Fibroma.htm. Accessed April 23, 2018. Ledderhose disease treatment. United Kingdom: British Dupuytren’s society; 2018. Available from: http://dupuytrens-society.org.uk/treatment/ledderhose-disease/. Accessed cited 2018 April 23April 23, 2018. Ahuja RB, Chatterjee P. Comparative efficacy of intralesional verapamil hydrochloride and triamcinolone acetonide in hypertrophic scars and keloids. Burns. 2014;40(4):583–588. Jordan GH, Carson CC, Lipshultz LI. Minimally invasive treatment of Peyronie’s disease: evidence-based progress. BJU Int. 2014;114(1):16–24. Grenfell S, Borg M. Radiotherapy in fascial fibromatosis: a case series, literature review and considerations for treatment of early-stage disease. J Med Imaging Radiat Oncol. 2014;58(5):641–647. Heyd R, Dorn AP, Herkströter M, Rödel C, Müller-Schimpfle M, Fraunholz I. Radiation therapy for early stages of morbus Ledderhose. Strahlenther Onkol. 2010;186(1):24–29. Schuster J, Saraiya S, Tennyson N, Nedelka M, Mukhopadhyay N, Weiss E. Patient-reported outcomes after electron radiation treatment for early-stage palmar and plantar fibromatosis. Pract Radiat Oncol. 2015;5(6):e651–e658. Frizziero A, Barazzuol M, Vittadini F, Bellon G, Masiero S, Meneghini A. Plantar fascial fibromatosis: two cases treated with low-energy focused shock waves. J Clin Rheumatol. 2017;23(1):63–65. Yin MC, Ye J, Yao M, et al. Is extracorporeal shock wave therapy clinical efficacy for relief of chronic, recalcitrant plantar fasciitis? A systematic review and meta-analysis of randomized placebo or active-treatment controlled trials. Arch Phys Med Rehabil. 2014;95(8):1585–1593. Frairia R, Berta L. Biological effects of extracorporeal shock waves on fibroblasts. A review. Muscles Ligaments Tendons J. 2011;1(4):138–147. Knobloch K, Vogt PM. High-energy focussed extracorporeal shockwave therapy reduces pain in plantar fibromatosis (Ledderhose’s disease). BMC Res Notes. 2012;5:542. Patel SR, Benjamin RS. Desmoid tumors respond to chemotherapy: defying the dogma in oncology. J Clin Oncol. 2006;24(1):11–12. Hammoudeh ZS. Collagenase Clostridium histolyticum injection for plantar fibromatosis (Ledderhose disease). Plast Reconstr Surg. 2014;134(3):497e–499. Aluisio FV, Mair SD, Hall RL. Plantar fibromatosis: treatment of primary and recurrent lesions and factors associated with recurrence. Foot Ankle Int. 1996;17(11):672–678. Kadir HKA, Chandrasekar CR. Partial fasciectomy is a useful treatment option for symptomatic plantar fibromatosis. Foot. 2017;31:31–34. van der Veer WM, Hamburg SM, de Gast A, Niessen FB. Recurrence of plantar fibromatosis after plantar fasciectomy: single-center long-term results. Plast Reconstr Surg. 2008;122(2):486–491. de Bree E, Zoetmulder FA, Keus RB, Peterse HL, van Coevorden F. Incidence and treatment of recurrent plantar fibromatosis by surgery and postoperative radiotherapy. Am J Surg. 2004;187(1):33–38. Lui TH. Endoscopic Subtotal Fasciectomy of the Foot. Arthrosc Tech. 2016;5(6):e1387–e1393. Kosi Gramatikoff. PF-PlantarDesign.jpg. Available from: https://en.wikipedia.org/wiki/File:PF-PlantarDesign.jpg. Accessed December 12, 2018. Radiopaedia. Plantar fibromatosis. Available from: https://radiopaedia.org/cases/plantar-fibromatosis. Accessed December 12, 2018. Radiopaedia. Plantar fibroma. Available from: https://radiopaedia.org/cases/plantar-fibroma-2. Accessed December 12, 2018.